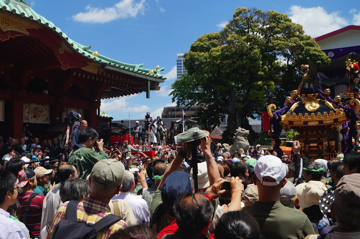 One gathering we attended was Kanda Matsuri, a Shinto festival in the Kanda area of Tokyo. In brief, each neighborhood community has its own kami (pronounced kah-mee, meaning ‘god’) that watches over that community from a small local home. Once a year, a large portable shrine is carried (by many hands) to the local home, the kami moves into the portable shrine, and the people carry it to the main shrine for a blessing. This stripped-down description does not convey the energy of the festival, as the streets are lined with thousands of spectators cheering for the passing shrine. For Kanda Matsuri, over one hundred portable shrines are carried to the main shrine, and the procession of blessings fills the entire day. This public display of worship presents a contrast to religion in the west, so often practiced inside, with the doors shut and the shades drawn. The procession reached the main shrine during Kanda Matsuri. One of the small, portable shrines is visible on the right and the main shrine is on the left. Public celebration of God is a part of each Christian’s heritage, however, as in David’s time when they brought the Ark of the Covenant into Jerusalem or when Jesus entered Jerusalem on a donkey to people shouting “Hosanna!”. The people in the matsuri possess something we have lost. At the same time, I believe those small kami houses were empty, whereas the Ark of the Covenant and Jesus were full of the power of the Lord. It is sad that God is the author of life while His people are often lifeless, yet those empty shrines inspired such joy. 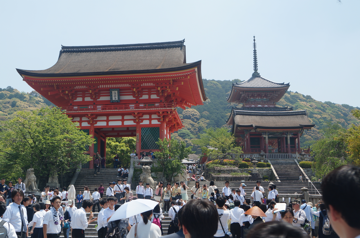 Kiyomizu Dera, one of the exquisite temple complexes in Kyoto. I believe that sometimes Christians get stuck trying to show the world that our ways are “better” than the rest of the world. That is, that our music is livelier, our buildings grander. We are called to represent God with excellence. So if we play music, or invite people to our building, or into our home, or greet them, or cook for them, we should do those things with excellence because we serve a great and wonderful God. But, these things can be also be imitated by those who do not serve God. Not only imitated, but done better. 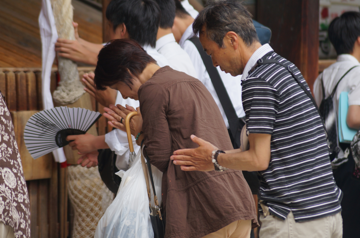 This has been evident in my experiences in Japan, from the buildings and festivals to the hospitality and smiling faces, there is nothing that Christians do better on the outside. The goal of Christian ministry must go beyond good presentation and take people to the truth of who Jesus is and what He has done for us. I returned from Japan and began an intense study of 1 Cor 15, the passage where Paul argues that without the resurrection, Christianity is a vanity - looking good on the outside but empty on the inside - and anyone who believes it should be pitied. Paul emphasized throughout the passage, however, that the death, burial, and resurrection are true, actual events that took place and were witnessed by many people, referring to those four elements of the Gospel (death, burial, resurrection, appearance) as being of “first importance.” Paul states that while in Corinth he chose to share nothing but Christ crucified. While this is not a command (and may have been a choice he made specifically in Corinth), there are several good reasons to follow Paul’s example. When we emphasize Jesus over the superficial elements of Christianity, we give people the opportunity to accept or reject Jesus, rather than the superficial elements of our religion, which can’t save them. For a person who does not believe in the death, resurrection, and lordship of Jesus to become someone who does believe is a great work of God. There is no reason to burden the truth with unnecessary complications. Mt. 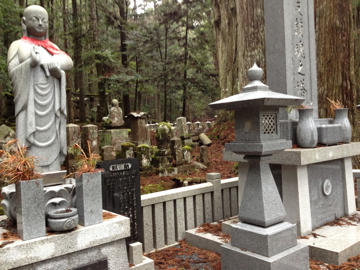 Koya, a beautiful tomb and final resting place of Kobo Daishi, the founder of Shingon Buddhism. The death and resurrection of Christ are imitation-proof. Buildings, festivals, hospitality, and all the rest are susceptible to imitation and may even be inferior to their non-Christian counterpart. Jesus rose from the dead! This is His evidence that He is Lord of all. Whether a Buddha has a more beautiful tomb than Jesus is irrelevant. Jesus’ tomb is empty! Just as Jesus sets Himself apart from other gods, we are not called to represent Jesus merely by being winsome or impressive. Rather, we must be founded on God’s reality and our knowledge that He is alive, present, and the master of life and death.